Advantages Of Solar Energy Are Great And Promise A Bright Future! The Advantages Of Solar Energy Are Great And Promise A Bright Future! We will show you how the advantages of solar energy will have an economic impact for you, the nation, and the world, and help to ensure a more stable environment. Solar energy is bettering the world in many ways and the benefits are only expected to increase in the coming years. It generates free electricity, from an abundant power supply, the sun. It can be portable, allowing for a wide range of applications. It can provide security and comfort in times of emergencies and power outages, supplying guaranteed electric power. It frees us from the cost and uncertainties of worldwide energy supplies. We all have an opportunity to contribute to bettering our society in many different ways. By using free, renewable, clean solar energy, you can contribute to preservation of our environment in a big way. As a comparison between fossil fuel generated electricity and that from solar energy, each kilowatt of electricity produced from solar energy equals 830 pounds of nitrogen oxides, 1500 pounds of sulfur dioxide, and 217,000 pounds of carbon dioxide, every year, according to a report from the National Renewable Energy Laboratory. These are big numbers and highlight the true impact each of us can have. As we enter a new age, with competition for natural fuels growing, we must find a way to extend our planet’s life expectancy. No one can escape hearing about global warming, and we are all well aware of rising fuel costs. With this in mind, there are advantages of solar energy that you might not have known. Here are a few solar energy facts that will make you may find interesting. While solar PV systems have traditionally been very expensive to install, the cost has decreased substantially over the past 30 years, with as much as 100 fold price decreases. There are also many government incentives today to install solar power in your home, from the state and federal government. In some states, you may be able to install a system free after the tax rebates are figured in. Click here to see the rebates you may qualify for in your location. Solar energy will provide electricity in areas where it would normally be very expensive to take regular fueled energy. Also, remember one of the advantages of solar energy is that the fuel is free and abundant. Sunlight cost nothing to capture except the initial cost of the equipment. The initial cost is offset by the extraordinarily low maintenance that is required, and by the savings you will recoup as you continue to use the free power that the solar power system is generating. Solar energy systems are on the of the cleanest power sources we have today, emitting no greenhouse pollution, noise or hazardous waste, and they require no transportable fuels. One of the advantages of solar energy is that you are not only helping yourself, but you are helping the planet long term by decreasing emissions that increase global warming. Once installed, solar panels are good for many years of service. Twenty to thirty years is the projected life expectancy of solar energy panels, and this is one of the solar energy facts that have made businesses and government take a look at adding solar energy to their facilities. Washington DC has a large solar energy network, which will ensure that even with a power outage our country’s defenses will have a power source. This of course is one of the very important advantages of solar energy at a national level. In times of crisis, after a hurricane or other disaster relief efforts, solar energy panels along with solar energy storage systems can be transported to these locations, providing a life saving power supply in the time of need. This makes it one of the most versatile power sources available. 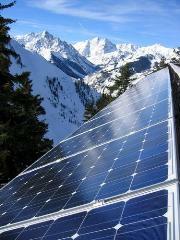 Solar systems (PV Systems) can be constructed any size to accommodate the energy needs at hand. A homeowner can add to their solar array, (series of panels connected together) as their power needs increase or as their finances allow. Many cities already use portable solar power of which you may have already seen, by powering lights for signs, portable lighting for road work at night, water pumping, communications and many other applications. Much of our fuel is produced in other countries. This makes us dependent on them for our energy sources. One of the advantages of solar power is that it frees us from relying on outsourcing our fuel to them. This will help to ease our trade deficit. Since the 1970’s when the solar energy industry was virtually nonexistent, the business of solar energy is now worth about $2 billion dollars. The solar energy industry today employees roughly 20,000 men and women in high value, high tech jobs of all kinds. And by 2020, the industry is expected to grow towards a work force of 150,000. ("Energy Alternatives and Jobs." 2000. Renewable Energy World, 3(6):November/December, pp. 26-32). The solar industry is growing at a steady pace and is only expected to continue. Since the 1990’s the market for solar energy has grown at an annual rate of 20%. The industry estimates that continuing growth rates of 25% annually are very possible, resulting in a $20 billion market by 2020. Since the Production of solar PV panels and systems are domestic, all of that economic growth will be at home, helping our economy to become more self sustaining. Having all of this production at home will also increase our exports, further helping reduce our trade deficit. With the knowledge of this solar power information it is easy to see how this technology can benefit us all in so many ways. 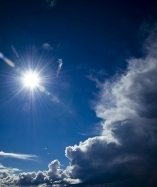 Yes there are many advantages of solar energy, but there are also some disadvantages. We would be remiss if we didn’t fill you in on these too. Installing a solar energy system of any kind, whether it be a solar heating system or home solar panels, they will have initial higher first costs than other conventional heating or electric systems. Yes you will probably spend more money initially, however you will recoup a large percentage, if not all of it back with tax rebates from your state and the government. Also you will recover all of your initial costs through your energy savings over time, and then it will just be money in the bank. Another issue the solar industry has to address, is when these solar panels have done their job and they need to be replaced, 20-30 years down the road, how are these going to be recycled? Today only a small number of PV panels are disposed of each year. However the solar industry is aware of this concern and is already exploring method of recycling PV panels in the future. As you can see there are many advantages of solar energy that will not only benefit you, but the nation and world as a whole. The advantages of solar energy certainly appear to outweigh the disadvantages of solar energy, and should continue to do so as this industry proceeds to thrive and grow at a rapid pace in the years to come. Return from advantages to facts about solar energy. Return from advantages of solar energy to solar energy scene home.